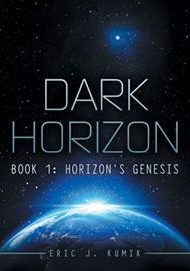 Eric J. Kumik’s first installment in the Dark Horizon series, Horizon’s Genesis, is a thrilling science fiction adventure. In this story, the Interstellar Exploration Corps (IEC) inexplicably loses communication with science expedition Team Alpha, but not before catching a glimpse of a piece of the Horizon, a spaceship once thought to be mere myth. The recalcitrant Star Team Seven is sent to discover what happened to Team Alpha and, more importantly, recover Horizon. En route, the crew runs into a familiar adversary: Velkaso, from whom captain Hammer and crewmate Dregs had escaped following an earlier mission. Velkaso steals the Horizon, and to retrieve it, Star Team Seven must traverse into unfriendly space. Commander Tivex and Dregs destroy Velkaso’s ship by opening a jump gate (similar to a worm hole) — but they also accidentally send Hammer through it in nothing more than a space suit. The characters are the lifeblood of this story. The quick, witty exchanges and actions of Star Team Seven skillfully illustrate the crew members’ deep concern for each other, and although the idea of a renegade crew is certainly not new in the science fiction world, this iteration feels fresh. Flashbacks are expertly executed, and the narrative divulges its backstories subtlely, through character behavior and dialogue. Some unnecessary repetition of information distracts at the book’s beginning. Also, certain moments of exposition bog down the narrative, such as Torque’s explanation of Hammer’s use of Helix, a green liquid that instantly heals but comes with the heavy price of addiction. Hammer’s backstory takes up a full chapter in the middle, and although interesting to his development, it stalls the action. Despite these issues, Horizon’s Genesis is a gripping, enjoyable read. It leaves just enough untold for readers to look forward to Book 2 of the series.